Do you have an accent chair in your home that you love and is in great condition but the dated fabric has it hiding in the basement for no one to see? We have one of those - a chair that Mr. Frugalista inherited with sentimental value. We splurged several years ago and had it upholstered. The fabric is still in mint condition but the gold color no longer works in our home. 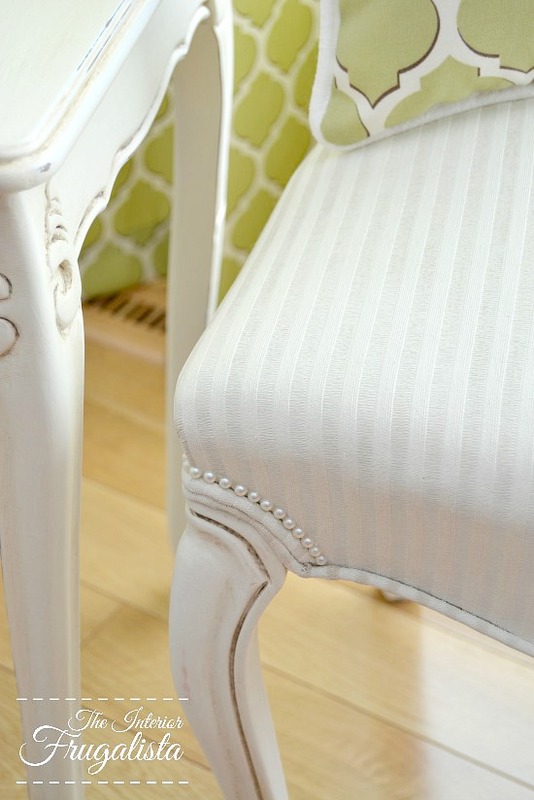 Replacing perfectly good fabric seems like a waste and so I took the budget-friendly approach and painted the fabric on the French Provincial chair instead. You can see there is nothing wrong with it and would be a shame to replace when there is another alternative. 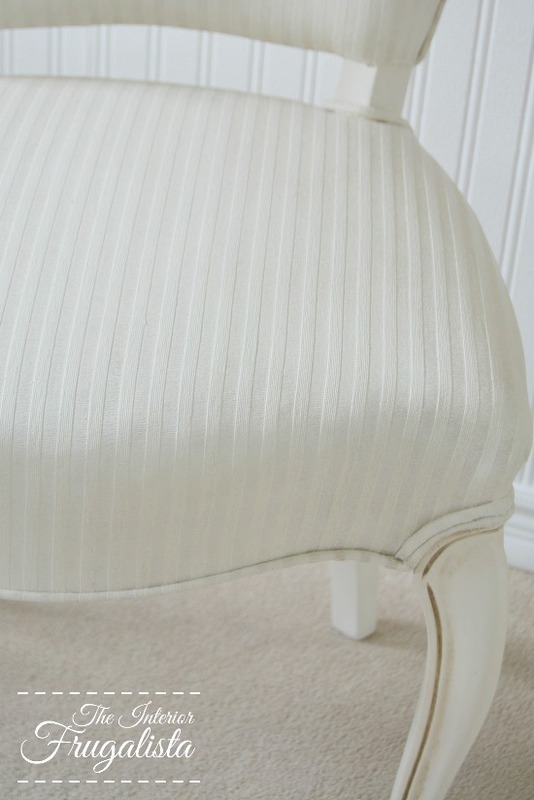 I created a custom color by mixing a 50:50 ratio of Annie Sloan pure white and old white chalk paint. 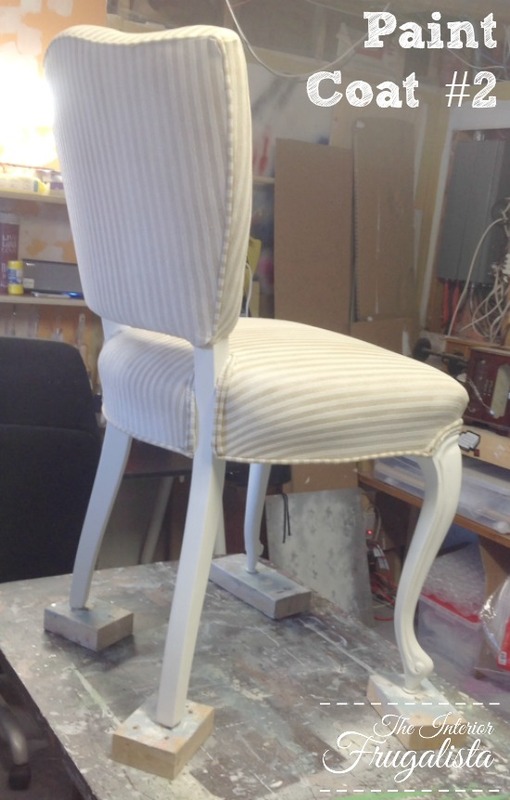 The photo below shows the chair after one coat of paint. This isn't my first time painting upholstery with chalk paint. I painted our burgundy Wing Chair red and a tufted armchair for a client. In the past, I used a 50:50 ratio of chalk paint and water. This time I tried a different method by dipping just the tips of my brush into water first, and then into undiluted chalk paint. I have to say I much prefer this method as it goes on so much smoother and with better coverage. 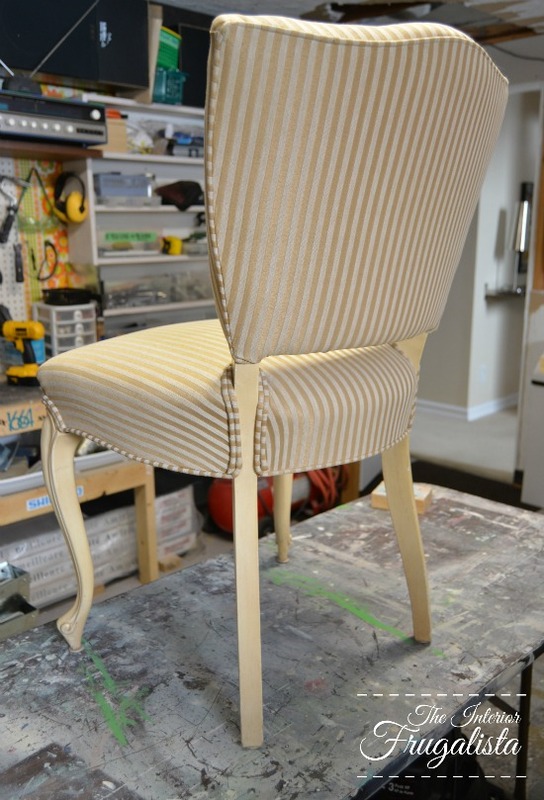 But first, like the other chairs, I lightly dampened the fabric first with a spray bottle and worked in sections. I should mention, wait for the paint to dry between coats. It took four coats to completely cover the gold stripes on my chair. 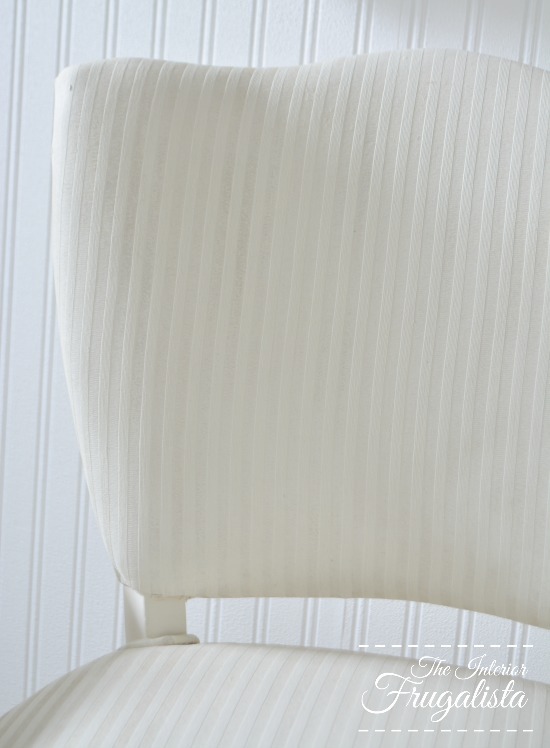 In the photo below you can get a closer look at how lovely the painted stripes give texture to the chair. 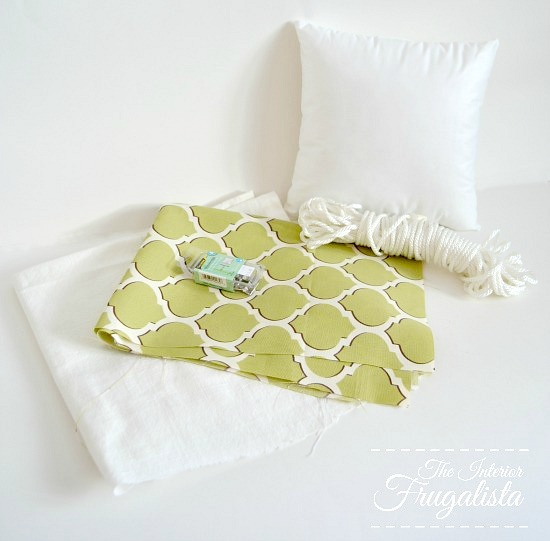 After the paint dries the fabric will feel stiff to the touch but once you give it a coat of clear wax with a round wax brush, it will soften the fabric like buttah. I would recommend, especially with a light color, to wait 30 days for the wax to cure before using the chair. I waited a week and brought it out for my daughter's baby shower and had denim stains all over the chair. 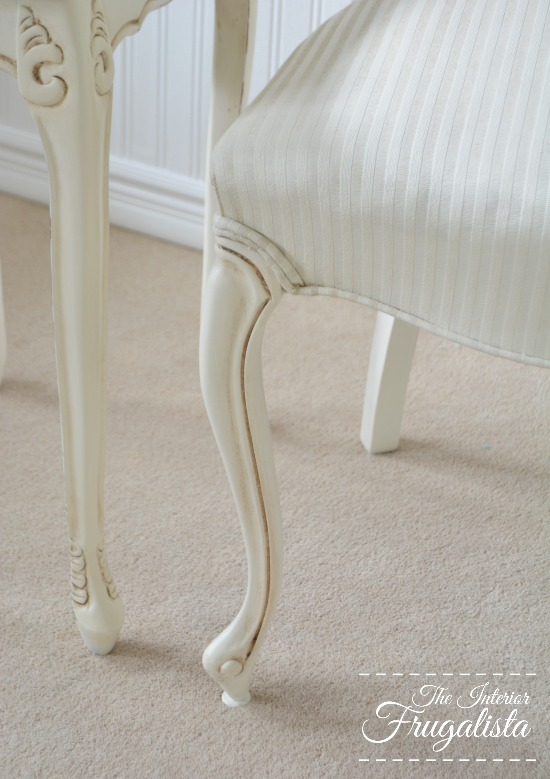 The wood frame of the chair was also painted white at the same time but I used dark wax to give them an aged patina. 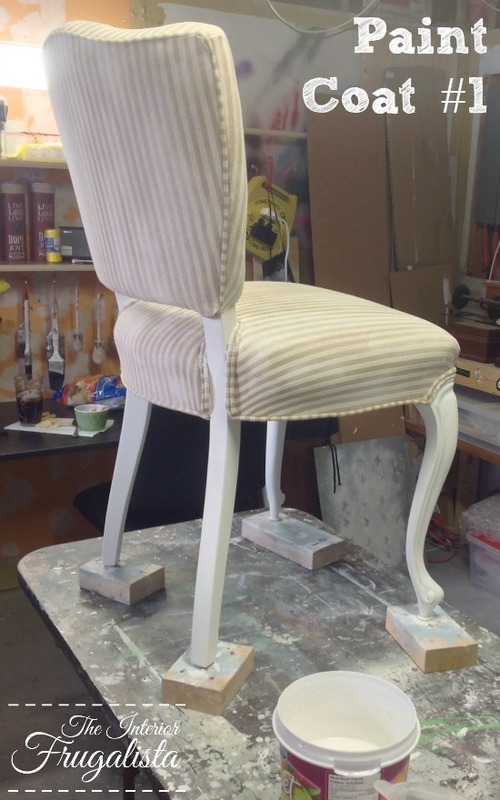 The photo below shows how I applied the wax into the ridges and along the recessed parts of the legs. 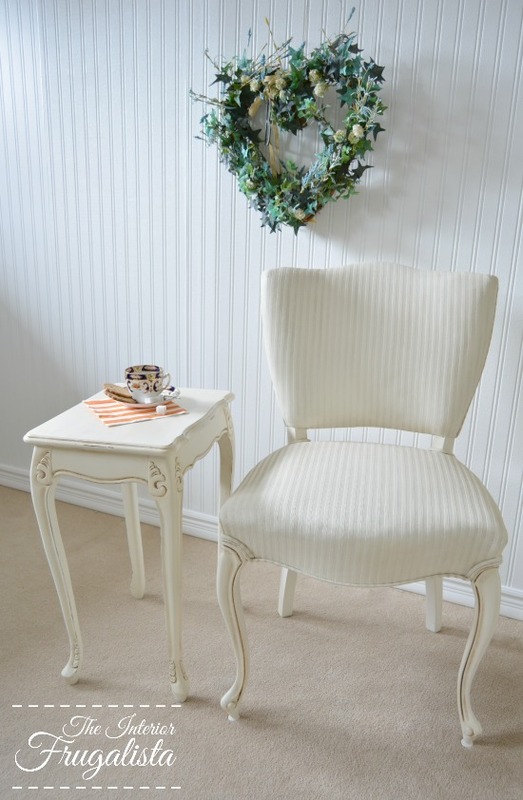 What a difference white paint made to this chair and it looks lovely paired with the small nesting table I also painted white. But I couldn't stop there. It felt like the chair needed a little something-something to dress it up. So I reached out on Facebook asking for feedback. The consensus was that I should leave the chair As Is and add some decorative upholstery tacks around the curve of the front legs. 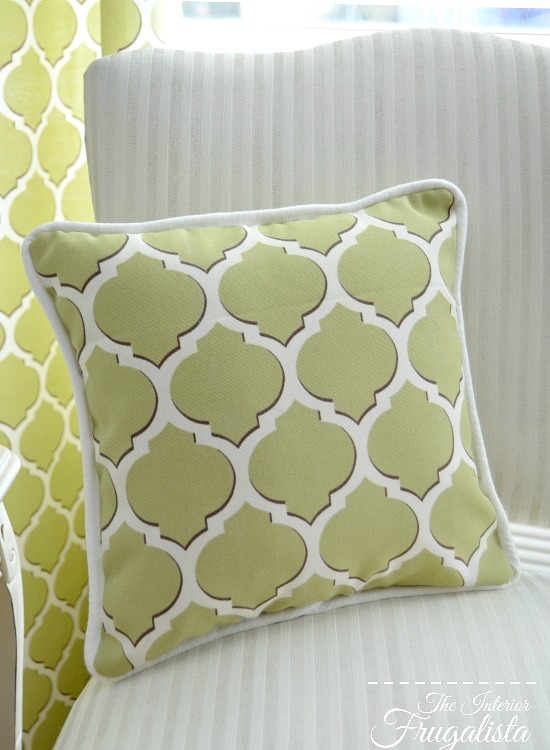 Another suggestion was that I add a pillow with a pop of color. As soon as I read those two suggestions I knew exactly what this chair needed. 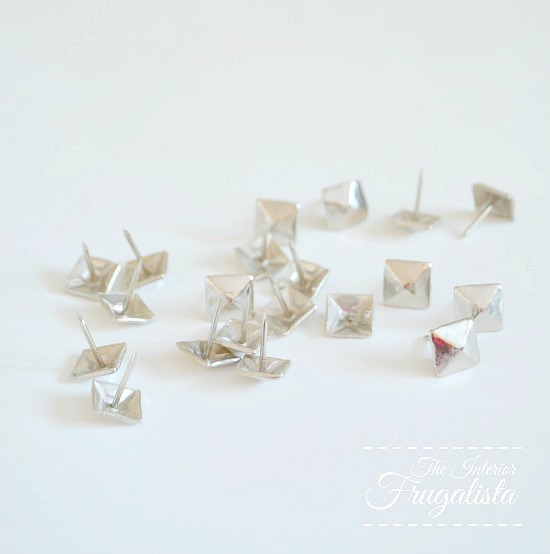 So I tried adding these silver upholstery tacks because our living room has silver accents and thought they would be perfect. FAIL - far too masculine for this curvy chair. 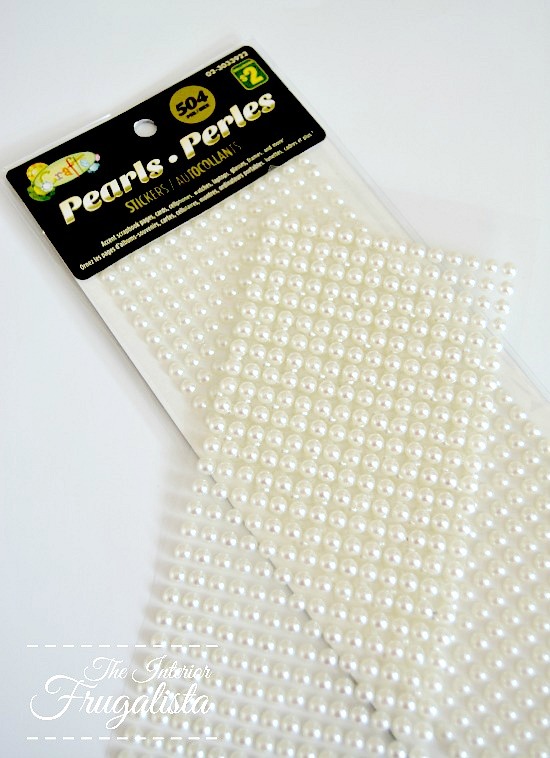 I had these pretty self-adhesive pearl stickers leftover from the Christmas Cone Trees made during the holidays. They come in long strips so they were easy to line up and hot glue in place. 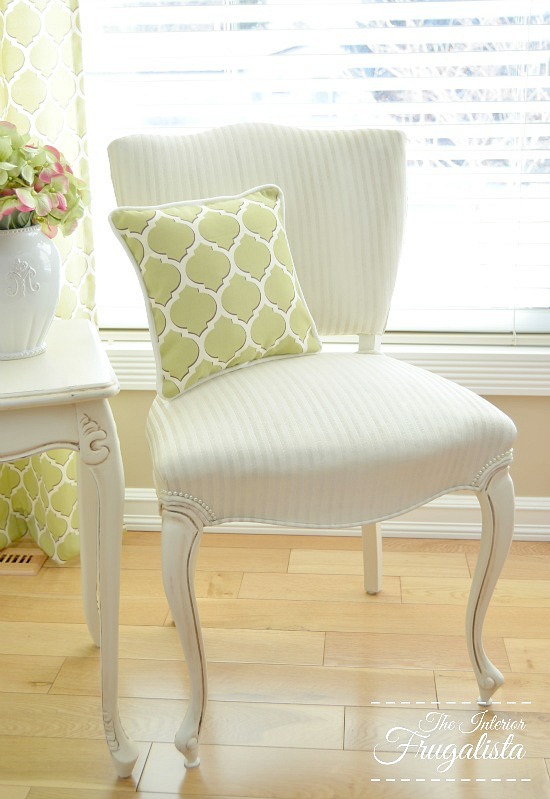 They add a lovely feminine touch to this French Provincial chair, don't you think? The second suggestion was adding a pop of color. I happened to have fabric in my stash leftover from the DIY kitchen roman shade that I made using an extra drapery panel from the living room. I also remembered I had some leftover fabric from the faux roman shade in the master bedroom that I made from drapery panels. While rummaging through my stash I also found some leftover clothesline cord used to make piping on the window seat cushion in the master bedroom AND I found a small pillow form. See where I'm going with this? 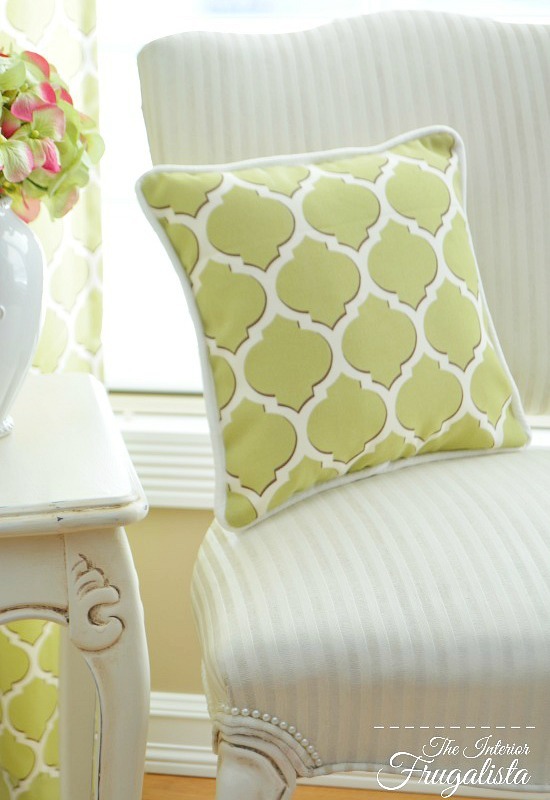 It took all of fifteen minutes and zero dollars to make and the perfect pop of color for the white painted chair. 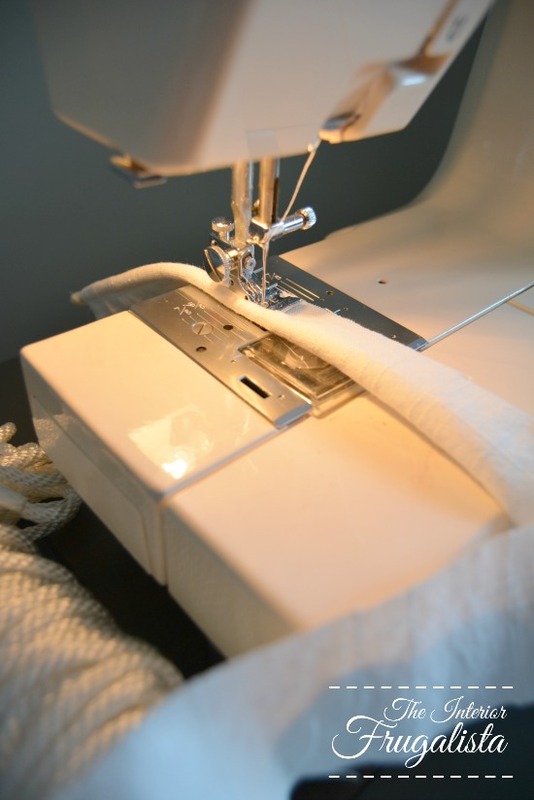 This post is long enough so I'm not going to get into a detailed tutorial on how to sew piping. In the photo below you can see that I used the zipper foot on my sewing machine and stitched tight against the fabric wrapped cording. It wasn't until after I added the photo below that I noticed a crease in the fabric. Oops, note to self - steam pillow. I'm so glad I reached out on facebook because thanks to you, the chair now has the perfect pop of color and feminine details that make it unique.